General Manager Jim Rutherford was hard at work through the night and this morning it showed as the Penguins and Matt Murray announced an extension for three years at $3.75 million per year, beginning next year. 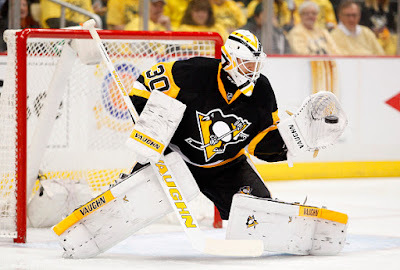 Murray burst on to the scene last year for the Penguins, taking over for incumbent franchise goalie Marc-Andre Fleury at the tail end of the season. A concussion suffered by Fleury gave Murray the net through the start of the Stanley Cup Playoffs and he never let go. Posting impressive numbers and leading the Penguins to the Cup, the net was thought to be Murray's going forward. A broken hand suffered during the early stages of the World Cup of Hockey has sidelined Murray so far this season, allowing Fleury to re-take the net. Going forward this could spell the end of Marc-Andre Fleury in Pittsburgh. Already thought to be on his way out with the emergence of Murray, a short term and inexpensive deal for the next man up should all but make this the former #1 pick's final season in Pittsburgh. Whether that end comes via trade or expansion remains to be seen.